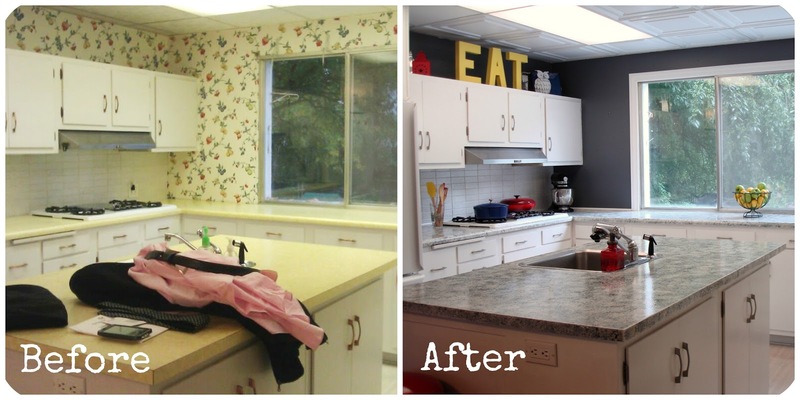 Homespun Luxe: $330 Kitchen Makeover!! We love that our house was built in 1910, but we hate that our house was decorated in the 1970s. So, my Mom and I spent one very long weekend updating one very yellow kitchen. I have to say, I could not be more thrilled with the results. Seriously. I spent an embarrassing amount of time this evening just sitting in there, staring. As part of my birthday present, my parents bought me a Giani White Diamond Countertop kit to cover the yellow laminate. 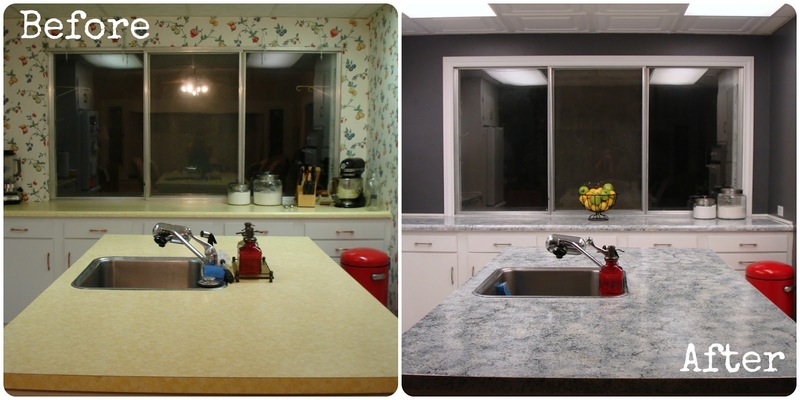 Since we were already painting the countertops, it made sense to paint the walls, too. The charcoal gray walls looked so good that the drop ceiling looked even more terrible in comparison. We didn't have the time or expertise to take down the ceiling and re-drywall, but we scored in a major way when we found the ceiling tiles that mimic a coffered ceiling. Once the ceiling tiles were in, though, wow did the cabinets look dingy. So we decided to paint them. That's really where the timeline went off the rails . . . Most of the accessories I used were mine already (platters, silver trays, canisters, etc.). The rest I picked up on clearance, except for the large, yellow EAT. For that, I simply spray painted cardboard letters from a craft store. Not bad at all. I can't wait to share the projects with you individually. In the meantime, be creative and enjoy!